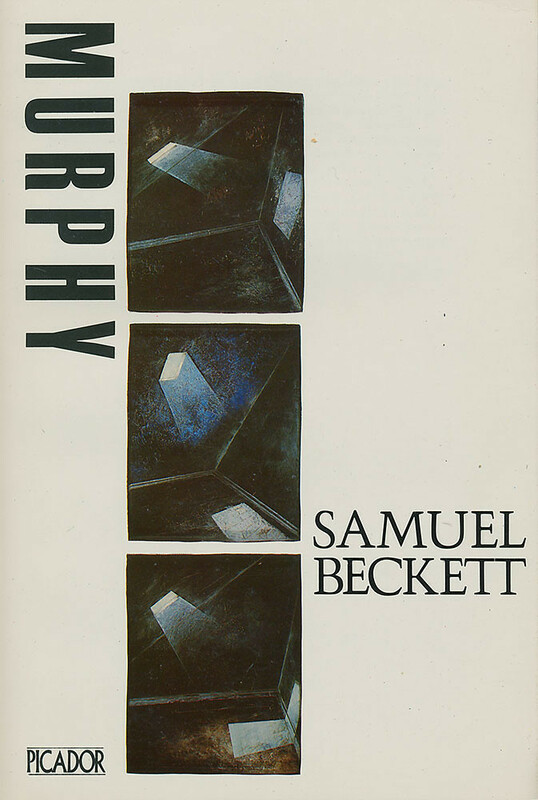 ‘The sun shone having no alternative on the nothing new.’ That was Dublin in 1983 and we laughed appreciatively with the grim humour of Beckett’s opening line in Murphy, writes John O’Reilly. Beckett’s Murphy is based in London where myself and other fellows would end up as home, and the central character ends up (like one of my best friends) getting a job in a psychiatric hospital – the ‘Magdalen Mental Mercyseat’. The research for the book was partly based on Beckett’s analysis with Wilfred Bion in the 1930s, and partly by visits to his friend Dr Geoffrey Thompson, who worked at the Bethlem Royal Hospital in Beckenham. 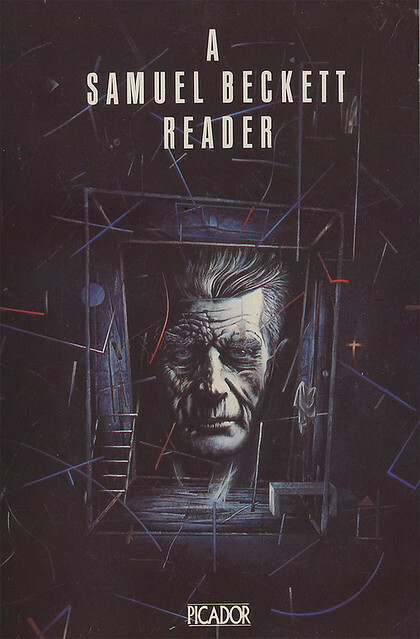 The cover image of the book was as spacious, fluid and stifling as Beckett’s story, a commission by Pan Art Director Gary Day-Ellison of illustrator Russell Mills. Mills’s set of images are called Murphy – Zones. In the novel, Murphy describes three zones of consciousness – light, half-light and dark – and these are Murphy’s zones of the imagination to play in, a typically minimalist Beckettian formula. Consciousness as repetition, difference, variation. Minimalism has been applied as a concept of style, in art, design and literature but Beckett invented a minimalist metaphysics that was modern and spatial, dark and funny. Beckett’s characters struggle for representational forms – Godot famously never appears – and like the chess game in Murphy, representation and its breakdown, is about a darkly humorous play of process about the failure of representation, about the creative experience of change. These images are a more oblique encounter with materials (working with materials other than graphite and chalk) that parallels Mills’s own professional encounter with Samuel Beckett himself. Which is how Darrach and I read Murphy, as an assemblage of words inside the book, Mills’s cover, as contingent performance in our replaying the chess game at the end of the novel between Murphy and the schizophrenic Mr Endon in the ward of the Magdalen Mental Mercyseat. The night before our first year Beckett tutorial, Darrach and I found a table in UCD’s Belfield bar – a prefab, beer-soaked improv of a building. We got the chess set from behind the counter and sustained by pints of stout moved the figures according to the chess game plotted by Beckett. After an hour of drinking and playing, Black ends up with his pieces exactly where they were on the adjacent side, the territory was the same, the geography was different. Dry. In Ireland, and now in Brexit Britain, too, Republicans, Loyalists, Unionists and Nationalists are all fine at marking territory and borders, but rubbish at the contingency and creative possibilities of geography. Unlike Mills’s Murphy – Zones cover image, which challenges our perception of figure and ground, challenges the idea that they they are fixed, that they are closed entities like the Ireland of 1983 like the wall of Trump, like the cultural and nativist wall of Brexit Britain. A shorter version of this appears in Varoom 35, ‘The Storytelling Issue’, February 2017. 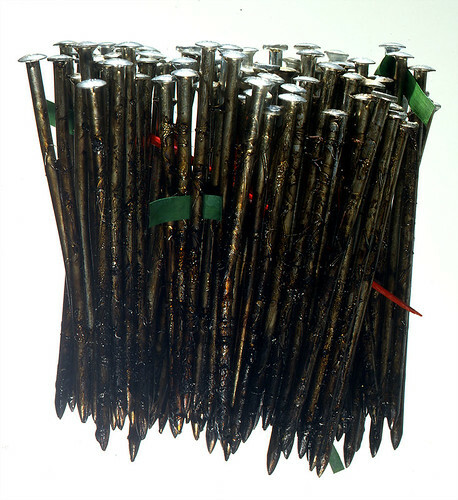 More Pricks Than Kicks (1982): nails, etching varnish, paper, acrylics, enamelled wood. 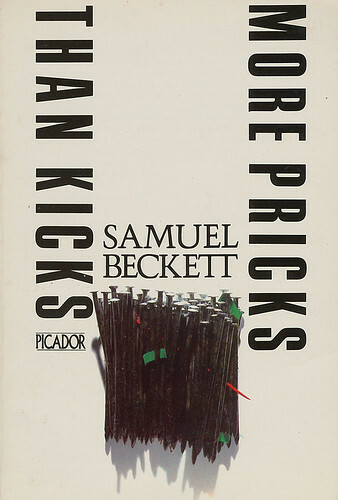 The title is a parody of the phrases ‘to kick against the pricks’ and ‘more kicks than ha’pence’ echoing the Biblical Acts of Apostles (IX 9:5 and XXVI 14), says Russell Mills talking to John O’Reilly: ‘It is of no use to rebel: if thou do, thou sickest against the pricks: and every act of rebellion against Him is a wound to thine own soul. God will either end thee, or mend thee: will thou then kick on?’ For Beckett his title suggests an individual’s struggle against fate and authority. 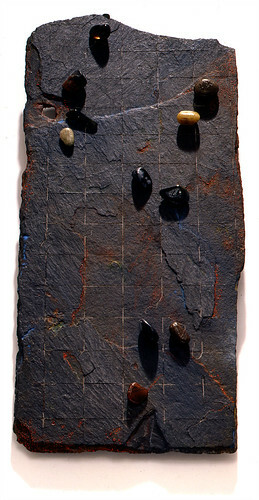 The work uses four-inch nails, densely packed, like a forest, covered in a thick glutinous bog-brown etching varnish. Claustrophobic, they allude to Irish censorship, as well as implying the sexual connotations in Beckett’s usage. Poking out of them are a couple of tiny rectangles of green paper, like flags, representing the green of Ireland, and a bright red enamelled pointed toothpick – a painful irritant to authority and the censors. Needless to say More Pricks Than Kicks was banned in Ireland until 1972. 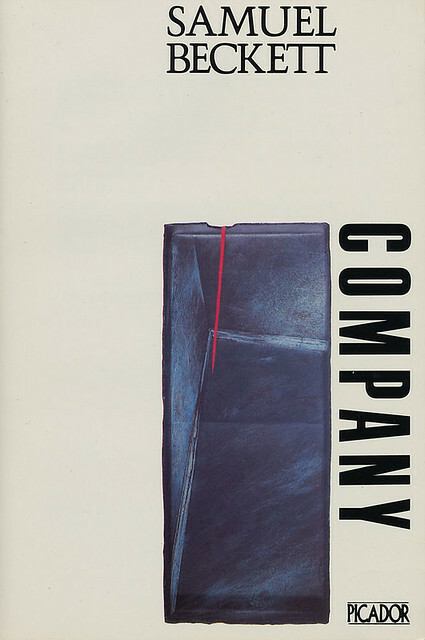 Company (1982): plaster, oils, acrylics, enamelled wood in cardboard box. Part autobiographical: an old man lying on his back alone in the dark is spoken to by voices devised by the listener for company; the story or fragmented stories are clearly taking place inside the old man’s head. In a state of ‘relaxation of consciousness’, imagination takes over and the self becomes liquid, malleable and multiple. The voice-tormented listener struggles with a need and obligation to imagine as well as his anguished awareness of waning powers and an inability to connect to the past. Beckett says, ‘Confusion too is company, up to a point’. The artwork suggests an enclosed space, a room, a box. It is pierced by a single bright red spear-like spike of enamelled wood, implying an intrusion, something unsettling, unwelcome or menacing, it is both an unavoidable irritant and a necessary prompt to trigger memories. Murphy (1983): plaster, oils, acrylics in three cardboard boxes. Murphy lives in West Brompton, a condemned mew – used in the singular rather than the usual ‘mews’, originally signifying a cage or building for trained (and especially moulting) hawks, and also, as a verb, meaning ‘to confine in a restricting place or situation’. Sat naked in a rocking-chair, secured by seven self-tied scarves, able to make ‘only the most local movements’, Murphy, his body appeased and his mind freed, seeks ‘that self-immersed indifference to the contingencies of the contingent world which he had chosen for himself as the only felicity and achieved so seldom’ to achieve a kind of Nirvana. The work, using three boxes, with the changing beam of light from a skylight, attempts to deal with Beckett’s explorations of Murphy’s three zones of consciousness that, through this habitual restrictive practice, he travels through in his desire to attain an existential state of being. 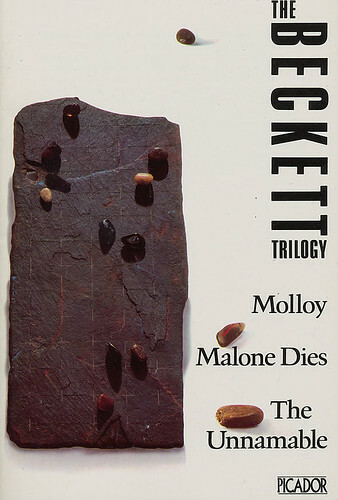 Trilogy: Molloy, Malone Dies, The Unnamable (dated 1979 but this edition was either 1982 or 1983): stones and chalk on scratched slate. As this cover had to deal with three novels I decided to concentrate on an image and an idea that would encapsulate the essence … Beckett’s concern with the disintegrating relationship between subject and object. As an exercise in withdrawal and striving to illuminate the illusions that we hide under – rather than face – the awful truth, Beckett seeks to reduce expression to communicate his bleak view of the world. In his efforts to escape the illusions that we live under, the need to think, the need to communicate, the need to comprehend everything around us, Beckett came to frightening conviction that this was beyond our faculties. Nonetheless we go on. We continue, somehow on, devising strategies for coping, for evading the awful truth. I decided to use the famous and hilarious ‘Sucking Stones’ passage in Molloy as my motif. 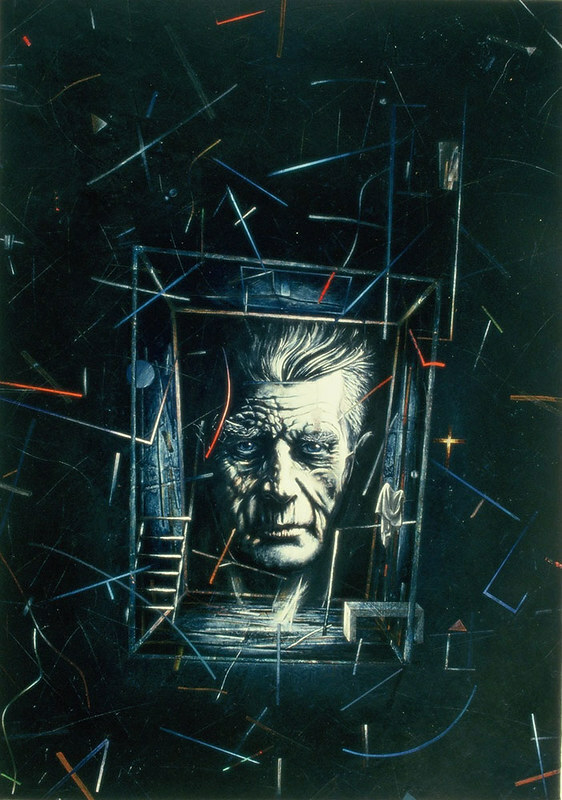 A Samuel Beckett Reader (1983): plaster, oils and acrylics on board. This necessitated a portrait, so I attempted one. Beckett’s head floats, ghost-like against and within a ground suggestive of numerous motifs from Beckett’s canon: a night sky and its possible astrological clues and cues, a transparent room or box merely defined by lines, stairs, draped fabric. Beckett has been a hero of mine since my teens and his writing still informs much of what I do. That commission was a real honour for me. I’m also pretty proud of them for their abstracted nature, made as they were when much of the illustration work being commissioned was still predominantly figurative and literal.